A garden designers favourite with its dramatic black foliage - similar to an Acer tree at a fraction of the cost. Flowering from May to June with 15cm blooms of creamy-pink flowers. The flowers can be used to make an interesting pink coloured home-made cordials or Elderflower Champagne! In autumn the flowers are followed by dark red berries that will attract birds to your garden. Supplied as established plant in 9cm pot, 15cm tall - dormant in Winter, so have no leaves then. 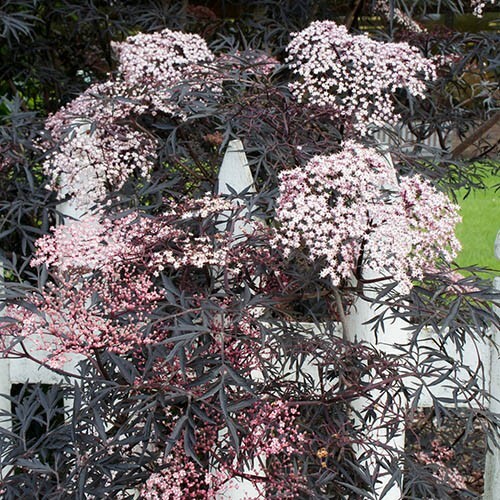 With its dramatic black foliage and beautiful creamy-pink flowers, Sambucus Black Lace is sure to turn heads! Its a real favourite with leading garden designers because of its stunning decorative foliage and manageability. Flowering from May to June, Black Lace produces stunning 15cm clusters of blooms that fade from creamy-white to dark-pink a contrast to its purple-black, deeply-ridged foliage whats more, theyll make an interesting pink coloured twist to home-made cordials or Elderflower Champagne! In autumn the flowers are followed by dark red berries that will attract birds to your garden. It looks like a desirable Acer tree but at the fraction of the cost, fully hardy and easier to manage no wonder its so popular! Supplied as an established plant in a 9cm pot. Sambucus are deciduous and lose their leaves in autumn. Please don't worry if yours looks a bit 'sticky' between October and March! To get a great display of fresh, dark leaves, cut back to ground level each year in early spring and apply a 5-7cm (2-3in) mulch of well-rotted garden compost or manure around the base. Sambucus will grow in most soild, as long as they are not waterlogged. To plant, water well, then dig a hole a little deeper and 3 x wider than the nursery pot. Add a soil conditioner such as well-rotted manure to the earth removed from the hole if necessary. Remove the plant from its pot and tease out a few of the roots. Place your plant in the hole at the same level at the pot. Refill the hole with the earth removed (backfilling). Firm in the soil with your heel, avoiding the root ball. Water well and mulch around the base of the plant with a collar, compost, gravel, bark etc.